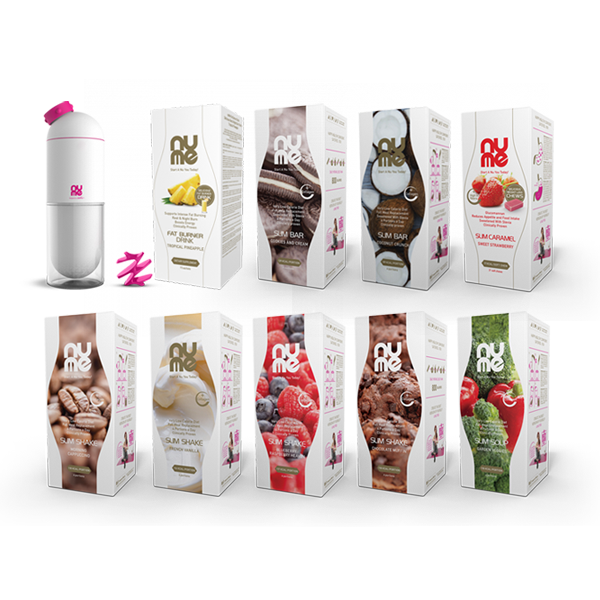 The nuMe Nutritional Plan is one of the most effective and clinically proven meal plans combined of 6 nuMe meals a day from delicious ALL IN ONE Slim Shakes, Soups and Bars with Collagen as the sole source of food in a Very Low Calorie Diet (VLCD <800 kcal). It gives an average weight loss of 1,5 - 3 kgs per week, while maintaining the lean mass. 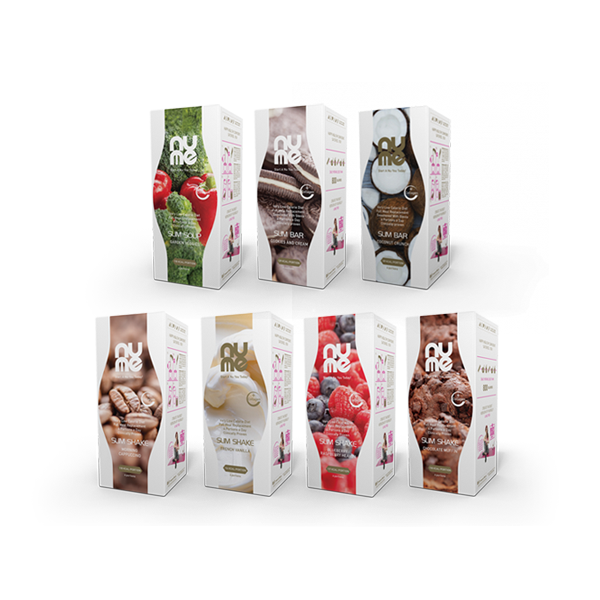 VLCD ensures that users of these nutrition plan are guaranteed to receive 100% of the vitamins, minerals and nutrients your body needs in a daily nutrition plan and with a minimum of calories. 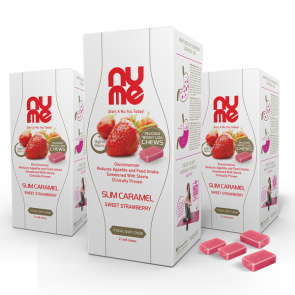 Additionaly nuMe Nutrition Plan is enriched by nuMe Slim Boost Soft Chew in Sweet Strawberry flavor with glucomannan. It prolongs feeling of satiety and reduces appetite and food intake. Designed to quench your craving for sweets with its irresistible strawberry flavor and whenever you need a quick fix for your hunger. nuMe product range complements amazing nuMe multifunctional shaker with mixing ball in which nuMe Slim Shakes and Slim Soups are created in creamy and delicious meals. 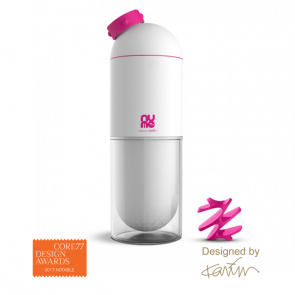 All packed in an environmentaly friendly, fashionable and multifunctional cases designed by the one and only Karim Rashid. Your nuMe journey is supported also by a great nuMe Body Guide [NBG] Plan which offers you complete program to your long-lasting transformation of lifestyle with NBG Workout, Coaching and Motivation Plan to help you discover the diamond in you. 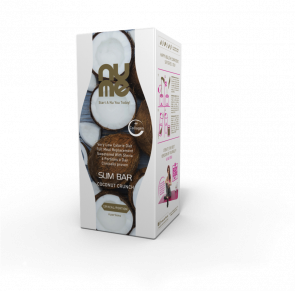 nuMe Slim Shake, Slim Soups and Slim Bars with Collagen are innovative nutritional and beauty solution specially designed to help you cope with moderate and severe weight problems, developed by doctor, personal trainer, and nutritionist. Designed for contemporary women striving to make complete transformation. Packed with all vitamins, minerals and other essential nutrients your body needs to support healthy weight loss, it can be used as the sole source of food in a very low calorie diet (<800kcal). A daily menu of 6 smaller portions helps you adapt to a completely new way of eating and shrinks your stomach, so nuMe Slim Food with Collagen changes your eating habits for good. Added collagen increases skin elasticity and firmness during the diet to prevent loose, saggy skin. Whenever you decide to go back to a more traditional diet, you will find it easier to limit your meals and maintain healthy weight. 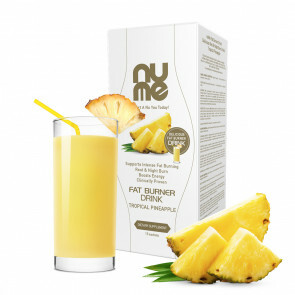 With its high nutritional value, low calorie count, no added sugar and enough protein to help you maintain your muscle mass, nuMe Slim Food with Collagen can replace all your daily meals, paving your way to a nu – slimmer, healthier and happier – you. 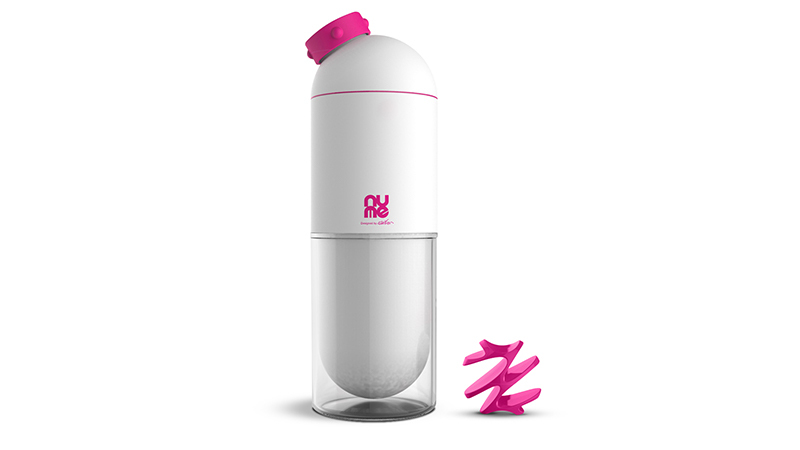 nuMe Multifunctional Shaker/ Water Bottle is designed for preparing delicious nuMe Slim Shakes and Slim Soups with Collagen On The Go. 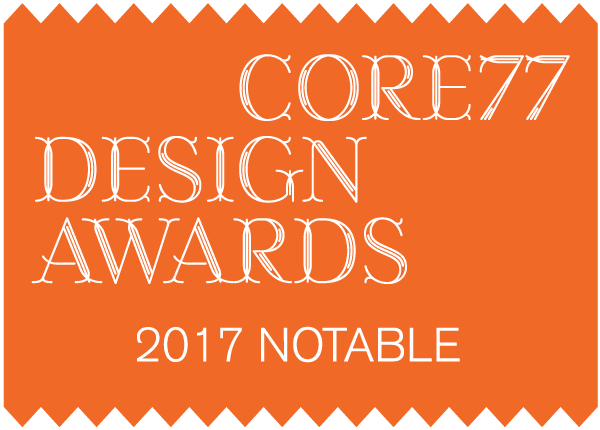 Includes mixing ball and integrated cup. Enjoy as shaker or water bottle (350 ml). Did you try sticking to a plan and your motivation is too low? Did you try losing weight not for yourself but everybody else? Did you always focus on your weight which is your concequence and not on your emotions where all your weight gain resulted? STOP. No matter where you are currently in your life journey you can start on the NBG Plan which will help you set goals, change those bad behavioral patterns from the past and develop the lifelong habits necessary to retain the benefits of all your hard work! ›› Don’t just exercise; make the most of your workouts with our 12 WEEK NBG™ Coaching Plan which consists of 36-step Master Class that will help you set goals, change those bad behavioral patterns from the past and develop the lifelong habits necessary to retain the benefits of all your hard work! ›› Stay motivated and build your confidence with daily push notifications, support from your online coach and the supportive nuMe community to guide you to success. Whether you’re still considering that first step, or looking to turbocharge your results, your personalized activity goal will help you achieve the long-term results you want. Available 2-, 4-, 8- and 12- week NBG™ Plans + 3-day FREE TRIAL.